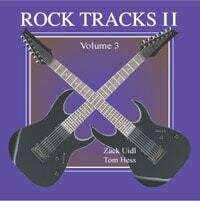 "Rock Tracks II" - Lead Guitar Improvising CD. Like the original Rock Tracks CD, "Rock Tracks II" contains a variety of awesome rhythm tracks (with a complete band). The main difference between the two CDs is that "Rock Tracks II" provides you with more advanced songs to solo over using a wider variety of scales/modes. Using the Rock Tracks CDs will become an important part of your lead guitar and improvising growth as a guitar player. Buy "Rock Tracks II" now to advance your soloing skills! If you enjoyed Rock Tracks - Volume 2, then you will also find Rock Tracks - Volume 1 useful. Hey Tom, I got the Rock Tracks CD earlier today....just got through jamming through them all. Excellent bro! I've tried a lot of these types of things [before] and I always walked away feeling irritated with some of the lame tracks...but these were killer...by far the best 'jam' tracks I've come across. Hi Tom, Kyle and I ordered the Jam Tracks CD and its totally kickass! By far the best jam tracks I've ever heard! Most of the ones online are not really suitable for heavy rock and metal and/or are just extremely cheesy, but this is great! Thanks for such a great tool! Mr. Hess, I just wanted to e-mail you to let you know that the Rock Tracks was a great idea! I love improvising over it. The great thing about Rock Tracks is that it's set up like a real song. It's not just a single progression/rhythm that loops over and over! Each song has a distinguishable form that makes it realistic to play over! It gives you good practice at changing your solo with the moods of the different parts! Because of the "song-like form" you can practice not just improvising, but actually writing realistic solos as well!!! This CD is going to improve my skills ten-fold!!! Thanks for the super fast shipping, I got the CD in only 2 days! I've been working with the disc all week and its a lot of fun! I can already hear some improvement in my soloing. Maybe its because the songs are all in different keys and in different moods. I found your suggestions about the rotating phrases very helpful! I have to be honest, when you first told me to do this, I thought you were joking. It seemed to me that your idea could never work with good results! Wow, was I wrong! I struggled the first 2 times I tried it, but on the second day, I it became more natural and I was actually doing it and it sounds great! You should write a book about this! Well, I mainly just wanted to tell you how much fun I'm having with "rock tracks".